Vine With Me is a duel minigame in Mario Party 3, and returns in Mario Party: The Top 100, where the "with" is lowercase. Its name comes from the phrase "fine with me". All the vines swing back and forth as the minigame starts. 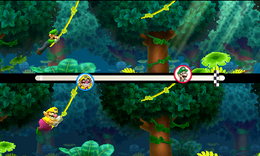 Players have to get to the end of the level by swinging with vines as fast as possible. If a player misses a vine, that player will be stunned for a moment, and will go back to the vine they previously grabbed. The first player to reach the end wins. Tumble: "Escape from the Piranha Plant Forest by swinging on the vines." Goomba: "Use vines to swing your way out of the Piranha Plant Forest!" Tumble: "You may be able to skip a vine here and there if you time your swings well." Goomba: "If you time it right, there may be places where you can skip a vine!" Description – "Jump at the right moment between swinging vines to reach the goal!" On-screen – "Jump from vine to vine to reach the goal!" The background of the minigame in Mario Party 3 appears to show a Piranha Plant resembling Naval Piranha. The French name of the minigame in Mario Party 3 is similar to the French name of the Ropey Rampage level in Donkey Kong Country. This page was last edited on January 20, 2019, at 15:01.